Chrissy M. Leopold Wager, Camaron R. Hole, Karen L. Wozniak, Michal A. Olszewski and Floyd L. Wormley Jr.
Nonprotective immune responses to highly virulent Cryptococcus neoformans strains, such as H99, are associated with Th2-type cytokine production, alternatively activated macrophages, and inability of the host to clear the fungus. In contrast, experimental studies show that protective immune responses against cryptococcosis are associated with Th1-type cytokine production and classical macrophage activation. The protective response induced during C. neoformans strain H99γ (C. neoformans strain H99 engineered to produce murine IFN-γ) infection correlates with enhanced phosphorylation of the transcription factor STAT1 in macrophages; however, the role of STAT1 in protective immunity to C. neoformans is unknown. The current studies examined the effect of STAT1 deletion in murine models of protective immunity to C. neoformans. Survival and fungal burden were evaluated in wild-type and STAT1 knockout (KO) mice infected with either strain H99γ or C. neoformans strain 52D (unmodified clinical isolate). Both strains H99γ and 52D were rapidly cleared from the lungs, did not disseminate to the CNS, or cause mortality in the wild-type mice. Conversely, STAT1 KO mice infected with H99γ or 52D had significantly increased pulmonary fungal burden, CNS dissemination, and 90–100% mortality. STAT1 deletion resulted in a shift from Th1 to Th2 cytokine bias, pronounced lung inflammation, and defective classical macrophage activation. Pulmonary macrophages from STAT1 KO mice exhibited defects in NO production correlating with inefficient inhibition of fungal proliferation. These studies demonstrate that STAT1 signaling is essential not only for regulation of immune polarization but also for the classical activation of macrophages that occurs during protective anticryptococcal immune responses. Cryptococcus neoformans, the predominant etiological agent of cryptococcosis, is an opportunistic fungal pathogen and frequent cause of life-threatening infection in individuals with impaired T cell function (i.e., persons with AIDS, lymphoid malignancies, and recipients of immunosuppressive therapies) (1–13). Cryptococcosis is considered an AIDS-defining illness and the most common mycological cause of morbidity and mortality among AIDS patients (14). Global estimates show that 1 million cases of cryptococcal meningitis occur in AIDS patients each year, resulting in ∼625,000 deaths (14). C. neoformans also remains the third most common invasive fungal infection among organ transplant recipients (13, 15, 16). Current antifungal drug therapies are oftentimes rendered ineffective because of the development of drug resistance or an inability of the host’s immune system to participate in eradicating the pathogen (17–19), necessitating new therapeutic strategies that consider the immune status of the host population commonly impacted by cryptococcal disease. C. neoformans is ubiquitous in the environment and exposure via inhalation of desiccated basidiospores or yeast into the lung alveoli often occurs in early childhood (20–22). The overwhelming majority of exposures result in asymptomatic disease and possible latency in immunocompetent individuals. However, in immunocompromised individuals, C. neoformans can spread from the lungs to the CNS, resulting in life-threatening meningoencephalitis (23). Because inhalation is the principal route of entry, the host is dependent on resident pulmonary phagocytes, such as macrophages, to contain the pathogen and prevent dissemination from the lungs. Studies using various experimental models of pulmonary cryptococcosis indicate that protection against C. neoformans infection is associated with the induction of Th1-type cytokine responses (IL-2, IL-12, IFN-γ, and TNF-α), increased lymphocyte infiltration, and classical macrophage (M1) activation (24–30). In contrast, Th2-type cytokine responses (IL-4, IL-5, and IL-13) are detrimental to the host and are associated with alternative macrophage (M2) activation (31–33). M1 macrophages are known for their capacity to efficiently kill phagocytized organisms through the production of reactive oxygen and nitrogen species (25, 31, 34–36). M2 macrophages, however, are associated with wound healing and are not efficiently microbicidal against C. neoformans (25, 31, 34–36). M1 macrophages produce NO and l-citrulline via inducible NO synthase (iNOS) by acting on the substrate l-arginine. Arginase-1 (Arg1) in M2 macrophages competes with iNOS for l-arginine to produce l-ornithine and urea (37), which is not fungicidal against C. neoformans (38, 39). Therefore, macrophage polarization toward an M2 phenotype, which occurs during infection with wild-type (WT) C. neoformans strain H99, results in uncontrolled fungal growth, dissemination, and exacerbation of disease (31, 35, 40, 41). Experimental pulmonary infection in mice with a C. neoformans strain engineered to express IFN-γ, designated H99γ, results in Th1-type and IL-17A cytokine responses, M1 macrophage activation, and resolution of the acute infection (26, 42). In addition, mice protectively immunized with C. neoformans strain H99γ developed an M1 macrophage activation phenotype during secondary challenge with a non–IFN-γ–producing WT C. neoformans strain (H99) and displayed enhanced fungistasis and NO production compared with macrophages from nonprotectively immunized mice following secondary challenge (24). Specifically, resolution of pulmonary C. neoformans infection in protectively immunized mice was associated with M1 macrophage activation that coincided with robust STAT1 phosphorylation (24). STAT1 signaling via the IFN-γ-JAK1/2-STAT1 pathway leads to the formation of phospho-STAT1 homodimers that translocate to the nucleus, bind to γ-activated sequences, and promote the transcription of STAT1 target genes (reviewed in Ref. 43). STAT1 signaling and its downstream products have been tied to the generation of Th1-type immune responses (44–46) that are protective against cryptococcosis and associated with M1 macrophage activation (24–30, 32). Little is known about the role of STAT1 in antifungal immunity. Specific mutations that alter STAT1 function (loss-of-function or gain-of-function mutations) have been shown to increase susceptibility/interfere with host defenses to fungal infections such as chronic mucocutaneous candidiasis (47, 48), coccidioidomycosis, and histoplasmosis (49). The role of STAT1 signaling during Cryptococcus infections has not been studied previously. The objective of the studies presented in this paper was to determine the role of STAT1 in the generation of protective immunity against C. neoformans, including its role in mediating M1 macrophage activation and antifungal activity in mice. Using STAT1 knockout (KO) mice, we demonstrated that STAT1 signaling promotes Th1-type immune responses but, most importantly, is required for M1 macrophage activation and subsequent protection against experimental pulmonary infection with C. neoformans strain H99γ. To our knowledge, these data provide the first evidence of an effector cell population and the intracellular signaling mechanism by which the host mounts a protective immune response to C. neoformans. Female STAT1 KO (129S6/SvEv-Stat1tm1Rds) and WT control mice (129S6/SvEvTac) from Taconic Farms (Germantown, NY) and female IFN-γ KO (C.129S7(B6)-Ifngtm1Ts/J) and WT control mice (BALB/cJ) from The Jackson Laboratory (Bar Harbor, ME) were used throughout these studies. Mice were housed at the University of Texas at San Antonio Small Animal Laboratory Vivarium and handled according to guidelines approved by the Institutional Animal Care and Use Committee. C. neoformans strain H99γ (derived from H99 serotype A, mating type α) (50) and C. neoformans strain 52D (serotype D) (a gift from Dr. Brian Wickes, University of Texas Health Science Center at San Antonio, San Antonio, TX) were recovered from a 15% glycerol stock stored at −80°C prior to use in the experiments described in this study. The strain was maintained on yeast extract/peptone/dextrose (YPD) medium agar plates (BD Biosciences, Sparks, MD). Yeast cells were grown for 16–18 h at 30°C with shaking in liquid YPD broth, collected by centrifugation, washed three times with sterile PBS, and viable yeasts were quantified using trypan blue dye exclusion on a hemacytometer. Mice were anesthetized with 2% isoflurane using a rodent anesthesia device (Eagle Eye Anesthesia, Jacksonville, FL) and then given an intranasal inoculation with 1 × 104 CFU C. neoformans strains H99γ or 52D in 50 μl sterile PBS. The inocula used for nasal inhalation were verified by quantitative culture on YPD agar. Mice were euthanized on predetermined days by CO2 inhalation, followed by cervical dislocation, and lung tissues were excised using aseptic technique. For survival analyses, mice were inoculated as stated above and monitored twice daily for up to 60 d postinoculation. For fungal burden analysis, the left lobe of the lung was removed and homogenized in 1 ml sterile PBS. A 50-μl aliquot was removed, serially diluted in sterile PBS, and plated on YPD agar supplemented with chloramphenicol. Plates were incubated for 48 h at 30°C, and fungal colonies were recorded. Cytokine production in lung tissues was analyzed using the Bio-Plex protein array system (Luminex-based technology; Bio-Rad Laboratories, Hercules, CA). Briefly, the left lobe of the lung was excised and homogenized in ice-cold sterile PBS (1 ml). An aliquot (50 μl) was taken to quantify the pulmonary fungal burden and an antiprotease buffer solution containing PBS, protease inhibitors (inhibiting cysteine, serine, and other metalloproteinases), and 0.05% Triton X-100 was added to the homogenate and then clarified by centrifugation (800 × g) for 10 min. Supernatants from pulmonary homogenates were assayed for the presence of IL-1α, IL-1β, IL-2, IL-3, IL-4, IL-5, IL-6, IL-9, IL-10, IL-12(p40), IL-12(p70), IL-13, IL-17A, CCL5/RANTES, Eotaxin, CXCL1/KC, CCL3/MIP-1α, CCL4/MIP-1β, CCL2/MCP-1, G-CSF, GM-CSF, TNF-α, and IFN-γ. Lungs were excised on days 7 and 10 postinoculation and digested enzymatically at 37°C for 30 min in 10 ml digestion buffer (RPMI 1640 medium and 1 mg/ml collagenase type IV [Sigma-Aldrich, St. Louis, MO]) with intermittent (every 10 min) stomacher homogenizations. The digested tissues were then successively filtered through sterile 70- and 40-μm nylon filters (BD Biosciences, San Diego, CA) to enrich for leukocytes, and then, cells were washed with sterile HBSS. Erythrocytes were lysed by incubation in NH4Cl buffer (0.859% NH4Cl, 0.1% KHCO3, and 0.0372% Na2EDTA [pH 7.4]; Sigma-Aldrich) for 3 min on ice, followed by a 2-fold excess of PBS. The resulting leukocyte population was then enriched for macrophages by positive selection using magnetic beads labeled with F4/80 Ab (Miltenyi Biotec, Auburn, CA), according to the manufacturer’s recommendations. Total RNA was isolated from purified F4/80+ cells using TRIzol reagent (Invitrogen, Carlsbad, CA) and then DNase (Qiagen, Germantown, MD) treated to remove possible traces of contaminating DNA, according to the manufacturer’s instructions. Total RNA was subsequently recovered using the Qiagen RNeasy kit. cDNA was synthesized from 1 μg total RNA using the oligo(dT) primer and reagents supplied in the SuperScript III RT kit (Invitrogen), according to the manufacturer’s instructions. The cDNA was used as a template for real-time PCR analysis using the TaqMan gene expression assay (Applied Biosystems, Foster City, CA), according to the manufacturer’s instructions. All real-time PCRs were performed using the 7300 real-time PCR system (Applied Biosystems). For each real-time PCR, a master mix was prepared on ice with TaqMan gene expression assays specific for iNOS, IFN-γ, TNF-α, CXCL9, CXCL10, IRF-1, suppressor of cytokine signaling-1, IL-17A, chitinase 3-like 3 (YM1), found in inflammatory zone 1 (FIZZ1), Arg1, IL-4, IL-13, and CD206 (Applied Biosystems). TaqMan rodent GAPDH (Applied Biosystems) was used as an internal control. The thermal cycling parameters contained an initial denaturing cycle of 95°C for 10 min, followed by 40 cycles of 95°C for 15s and 60°C for 60s. Results of the real-time PCR data were derived using the comparative Ct method to detect relative gene expression as described previously (26). Mice were sacrificed according to approved protocols, and the lungs were immediately perfused with sterile PBS by transcardial perfusion through the right ventricle. The pericardium and trachea were exposed by dissection, and an incision was made in the trachea for the insertion of a sterile flexible cannula attached to a 3-ml syringe. The lungs were slowly inflated with 0.5–0.7 ml 10% ultrapure formaldehyde (Polysciences, Warrington, PA), excised, and immediately fixed in 10% ultrapure formaldehyde for 24–48 h. The lungs were then transferred to 70% ethanol and subsequently mounted into cassettes and paraffin embedded by personnel at the University of Texas Health Science Center at San Antonio Histology and Immunohistochemistry Laboratory. After paraffin embedding, 5-mm sections were cut and stained using H&E with mucicarmine at McClinchey Histology Labs (Stockbridge, MI). Sections were analyzed with light microscopy using a Nikon microscope and microphotographs taken using Digital Microphotography system DFX1200 with ACT-1 software (Nikon, Tokyo, Japan) at the Ann Arbor VA Health System. Cell viability and quantity of F4/80+-enriched macrophage populations were assessed using trypan blue exclusion in a hemacytometer. Macrophages were cultured at a density of 5 × 105 cells per well in a 96-well tissue culture plate in RPMI 1640 medium (without phenol red) (Life Technologies, Grand Island, NY) supplemented with 10% heat-inactivated FBS, 2mM l-glutamine, and 100 μg/ml penicillin-streptomycin (complete medium). Macrophages were incubated in complete medium at 37°C with 5% CO2. Initial fungal burden was determined by lysis of the macrophages using sterile deionized water, followed by serial dilution and plating on YPD agar supplemented with chloramphenicol (Mediatech, Manassas, VA) for 48 h at 30°C. After 24 h of incubation, cell supernatants were collected, and an aliquot (50 μl) was used to determine NO production with Griess reagent (Sigma-Aldrich), according to the manufacturer’s instructions. Light absorbance values were measured at 540 nm using a BioTek Elx808 absorbance microplate reader with Gen5 version 1.04.5 software. Alternatively, F4/80+ macrophages were isolated and adjusted to 5 × 105 cells/well as described above and reactive oxygen species (ROS) measured using CellROX Deep Red Reagent (Life Technologies), according to manufacturer’s instructions and measured using BD FACSArray software on a BD FACSArray flow cytometer (BD Biosciences). Standard methodology was used for the direct immunofluorescence of pulmonary leukocytes. Briefly, in 96-well U-bottom plates, 100-μl containing 1 × 106 cells in PBS plus 2% FBS (FACS buffer) were incubated with 50 μl Fc block (BD Biosciences) diluted in FACS buffer for 5 min to block nonspecific binding of Abs to cellular FcRs. Subsequently, an optimal concentration of fluorochrome-conjugated Abs (between 0.06 and 0.5 μg/1 × 106 cells in 50 μl FACS buffer) was added in various combinations to allow for dual or triple staining experiments, and cells were incubated for 30 min at 4°C. Following incubation, the cells were washed three times with FACS buffer and were fixed in 200 μl 2% ultrapure formaldehyde (Polysciences) diluted in FACS buffer (fixation buffer). Cells incubated with either FACS buffer alone or single fluorochrome-conjugated Abs were used to determine positive staining and spillover/compensation calculations, and the flow cytometer determined background fluorescence. The samples were analyzed using BD FACSArray software on a BD FACSArray flow cytometer (BD Biosciences). Dead cells were excluded on the basis of forward angle and 90° light scatter. For data analyses, 30,000 events (cells) were evaluated from a predominantly leukocyte population identified by backgating from CD45+-stained cells. The absolute number of total leukocytes was quantified by multiplying the total number of cells observed by hemacytometer counting by the percentage of CD45+ cells determined by flow cytometry. The absolute number of leukocytes (CD45+ cells), CD4+/CD3+ T cells, CD8+/CD3+ T cells, CD19+/B220+ B cells, PMNs (1A8+/CD45+), MΦs (F4/80+/CD45+), DCs (CD11bint/CD11c+/CD45+), NK cells (Nkp46+/DX5+), NKT cells (Nkp46+/DX5+/CD4+), and eosinophils (SiglecF+/CD11bint) was determined by multiplying the percentage of each gated population by the total number of CD45+ cells. The unpaired Student t test was used to analyze fungal burden, cytokine/chemokine levels, pulmonary cell populations, ROS, and NO assays (two-tailed) using GraphPad Prism version 5.00 for Windows (GraphPad Software, San Diego, CA) to detect statistically significant differences. The One-Way ANOVA with Tukey’s posttest was used for real-time PCR analysis (GraphPad Software) to detect significant differences. Survival data were analyzed using the log-rank test (GraphPad Software). Significant differences were defined as *p < 0.05, **p < 0.01, or ***p < 0.001. Previous studies in our laboratory demonstrated that experimental pulmonary infection with C. neoformans strain H99γ in BALB/c and A/Jcr mice (24, 26, 50–52) and C129 mice (data not shown) results in clearance of the acute infection and the induction of protective immunity against a subsequent challenge with a WT C. neoformans strain that does not produce IFN-γ. Protection in H99γ-immunized mice against WT C. neoformans challenge occurred concurrent to the induction of STAT1 signaling within macrophages and M1 macrophage activation (24). To determine the requirement for STAT1 signaling in mediating protection against pulmonary cryptococcosis, STAT1 KO (129S6/SvEv-Stat1tm1Rds) and WT controls (129S6/SvEvTac) were intranasally inoculated with H99γ. Mice survival (morbidity) was monitored for 60 d postinoculation in one subgroup, whereas pulmonary fungal burden was quantified in another subgroup of infected animals at selected time points. WT mice had a 90% survival rate at day 60 postinoculation with H99γ (Fig. 1A). In comparison, STAT1 KO mice began to succumb to H99γ infection on day 12 postinoculation and had only a 10% survival rate by day 60 postinoculation (p < 0.001; Fig. 1A) with a median survival time of 18 d. The fungal burden was evaluated on days 7 and 10 postinoculation with H99γ (i.e., at the time points prior to the onset of mortality in STAT1 KO mice), which ensured the most accurate statistical analysis of the fungal burden. STAT1 KO mice showed significantly higher pulmonary fungal burden on day 10 postinoculation compared with infected WT mice (p < 0.001; Fig. 1B). Fungal burden in the WT mice did not increase from days 7 to 10, indicating that the host was able to control the growth of the yeast. 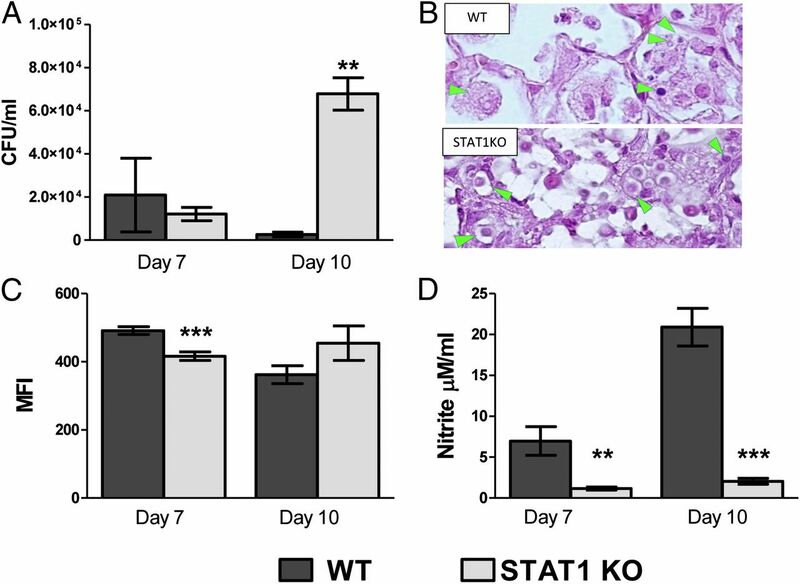 However, fungal burden in STAT1 KO mice was significantly increased on day 10 compared with day 7 in these mice (p < 0.001), revealing that they were unable to control proliferation of C. neoformans in the lungs. Therefore, STAT1 signaling is required for control of pulmonary infection with C. neoformans strain H99γ in mice. STAT1 signaling is required for control of pulmonary fungal burden and survival following inoculation with C. neoformans strain H99γ. 129S6/SvEv (WT) and STAT1 KO mice were given an intranasal inoculation with 1 × 104 CFU C. neoformans strain H99γ. Mice were observed for up to 60 d for survival analysis (A) or pulmonary fungal burden was analyzed at days 7 and 10 postinoculation (B). Experiments are cumulative of two experiments using five mice per group per time point (A) or two experiments using four mice per group per time point (B). **p < 0.01, ***p < 0.001. To determine the requirement of STAT1 signaling for protection against infection with a WT strain of C. neoformans, WT and STAT1 KO mice were intranasally inoculated with an unmodified clinical isolate, C. neoformans strain 52D, and survival monitored for 45 d postinfection. Inoculation with this strain is generally controlled in BALB/c mice; however, it is capable of inducing a chronic infection in C57BL/6 mice (53, 54). All WT mice infected with C. neoformans strain 52D were alive and appeared healthy upon conclusion of the experiment (Fig. 2A). In contrast, all STAT1 KO mice succumbed to the infection or were moribund by day 28 with a median survival time of 26.5 d. Postmortem analysis showed that moribund STAT1 KO mice had significantly higher pulmonary fungal burden compared with WT mice (p < 0.01; Fig. 2B). In addition, STAT1 KO mice showed evidence of massive CNS dissemination (Fig. 2B) unlike the WT mice, which were negative for CNS fungal cultures with the exception of 1 of 10 WT mice that had detectable (one colony) C. neoformans in the brain. These results indicate that STAT1 signaling is required for the induction of immune protection against C. neoformans and prevention of fungal dissemination into the CNS. Control of pulmonary fungal burden, CNS dissemination, and survival during WT C. neoformans strain 52D inoculation are dependent on STAT1 signaling. 129S6/SvEv (WT) and STAT1 KO mice were given an intranasal inoculation with 1 × 104 CFU C. neoformans strain 52D. Mice were observed for up to 45 d for survival analysis (A), and pulmonary and brain fungal burden were analyzed postmortem (B). Experiments are cumulative of two experiments using five mice per group per time point. **p < 0.01, ***p < 0.001. To further characterize the defect in pulmonary control of cryptococcal growth in STAT1 KO compared with WT mice, we examined histological sections of the infected and uninfected mouse lungs at day 10 postinoculation. Although the uninfected lungs of WT and STAT1 KO mice showed normal morphology (Fig. 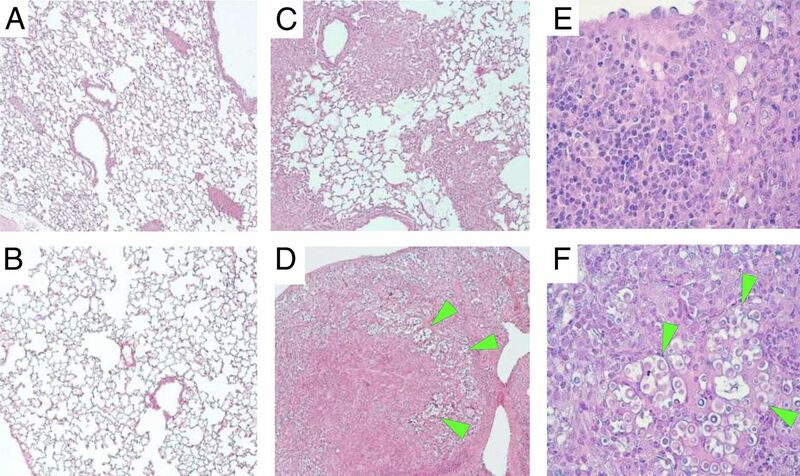 3A, 3B), histological examination of infected lungs at day 10 postinoculation revealed the development of severe lung pathology in the absence of STAT1 expression (Fig. 3D, 3F). The inflamed areas in the lungs of the WT mice at day 10 show that both infection and the inflammatory response are well contained within granulomatous foci, whereas the majority of the lung tissue remains clear of the infection/inflammation (Fig. 3C). In contrast, virtually all lung tissue from STAT1 KO mice is severely laden with cryptococcal organisms and infiltrated with inflammatory cells (Fig. 3D), consistent with uncontrolled growth of the microbe and a nonprotective immune/inflammatory response. Analysis of histological sections under high-power magnification demonstrates that, in addition to major differences in fungal burden, cellular composition of inflammatory infiltrates varies between the WT and STAT1 KO mice. Minimal presence of cryptococcal organisms and predominance of lymphoid cells and macrophage-type cells within the infiltrates of WT mice is consistent with the development of a protective immune response (Fig. 3E). In contrast, the abundance of cryptococcal organisms accompanied by mixed inflammatory infiltrates with enhanced presence of granulocytes (eosinophils and PMNs) and lower frequency of lymphoid cells characterize the lesions within the infected lungs of STAT1 KO mice (Fig. 3F). Such severe pneumonia and lung consolidation could explain the mortality observed in STAT1 KO mice and indicate that the immune response in the lungs of STAT1 KO mice, albeit robust, is nonprotective. Uncontrolled C. neoformans expansion and severe lung pathology develop in H99γ-infected STAT1 KO mice by day 10 postinfection. 129S6/SvEv (WT) and STAT1 KO mice were given an intranasal inoculation with 1 × 104 CFU C. neoformans strain H99γ or left uninfected. Lungs of uninfected (A and B) and H99γ-infected (C–F), WT (upper row), and STAT1 KO mice (lower row) were collected on day 10 postinoculation, processed, and analyzed using light microscope. Deletion of STAT1 that did not affect morphology of uninfected lungs has resulted in the development of severe lung pathology and massive expansion of fungus by day 10 postinoculation. Note that the infection and inflammatory response are contained within portions of the lungs in the WT mice (C), whereas virtually all lungs are infected and consolidated in STAT1 KO mice (D). High-power images show minimal presence of cryptococcal organisms and predominantly mononuclear cell infiltrates with lymphoid and macrophage-type morphologies within infected lungs areas in the WT mice (E), contrasting with granulocyte-enriched mixed cellular infiltrate surrounding clusters of proliferating cryptococci (green arrows) and in the lungs of STAT1 KO mice (F). Histological slides were stained with H&E and mucicarmine, and images were taken at original magnification ×10 (A–D) and original magnification ×40 (E and F), objective power. Images are representative of images derived from two experiments using three mice per group. Our histology data suggest that STAT1 deletion results in a significantly altered immune/inflammatory response in H99γ-infected lungs. To further characterize and quantify these differences, flow cytometry analysis of isolated pulmonary leukocytes from enzymatically dispersed lungs of WT and STAT1 KO mice was performed at days 7 and 10 postinoculation. A trend toward increased leukocyte infiltration to the lungs of the STAT1 KO mice has been noted at day 10. However, we observed no statistically significant differences in total CD45+ leukocyte numbers (Fig. 4A), suggesting that the differences in histological appearance of the inflammatory response were caused predominantly by differential distribution/density of the inflammatory infiltrates, rather than the major changes in total leukocyte number. In addition, there were no significant differences in the numbers of infiltrating leukocyte subsets including macrophages, dendritic cells, CD4+ and CD8+ T cells, B cells, and neutrophils (Fig. 4B–G) at days 7 and 10 postinoculation with H99γ in STAT1 KO mice compared with WT mice. However, the absolute number of NK cells in STAT1 KO mice was significantly lower (p < 0.05; Fig. 4I), and the absolute number of CD4+ T cells in STAT1 KO mice trended lower (p < 0.08; Fig. 4D) at day 10 postinoculation compared with WT mice. In contrast, eosinophils, which are associated with a Th2-type immune response and a hallmark of disease progression, were significantly increased in STAT1 KO mice at days 7 and 10 postinoculation compared with WT mice (p < 0.05; Fig. 4H). Neutrophils also showed an increasing trend (p < 0.146; Fig. 4G) in STAT1 KO mice at day 10 postinoculation. Collectively, these data suggest that STAT1 is not required for induction of the inflammatory response/recruitment of leukocytes into the lungs; however, STAT1 ablation does impact the phenotype of the cellular response to C. neoformans strain H99γ. STAT1 is not required for pulmonary infiltration by immune cells in response to C. neoformans strain H99γ infection. 129S6/SvEv (WT) and STAT1 KO mice were given a pulmonary inoculation with 1 × 104 C. neoformans strain H99γ yeast cells. At days 7 and 10 postinoculation, lungs were excised, tissue was digested, and pulmonary infiltrates were analyzed by flow cytometry. Leukocytes were labeled with anti-CD45 Abs for total leukocytes (A) or dual labeled with anti-CD45 and Abs for specific cell types (B–I) and analyzed by flow cytometry. Data shown are the mean ± SEM of absolute cell numbers from three independent experiments performed using four mice per group per experiment. *p < 0.05. The changes in fungal control and cellular composition of the inflammatory infiltrates suggested that STAT1 expression affected the type of immune response/cytokine response during pulmonary inoculation with C. neoformans strain H99γ. We next determined how STAT1 deletion impacted cytokine expression in the infected lungs by analyzing lung homogenates from STAT1 KO and WT mice on days 7 and 10 postinoculation with C. neoformans strain H99γ for cytokine protein content. The levels of Th1-type cytokines IL-2, IL-12p40, and IL-12p70 in STAT1 KO mice were similar relative to WT mice on day 7 postinoculation (Table I). IL-12p70 was significantly increased in the STAT1 KO mice compared with WT mice at day 10 postinoculation (p < 0.05); however, IL-12p40 levels were significantly decreased at day 10 postinoculation in STAT1 KO mice compared with WT mice (p < 0.01). IFN-γ levels were significantly decreased at days 7 (p < 0.05) and 10 (p < 0.01) postinoculation in STAT1 KO mice compared with WT mice, despite the increase in pulmonary fungal burden of the IFN-γ–producing C. neoformans strain in the lungs of STAT1 KO mice (Fig. 1B). The available methodology does not allow us to directly distinguish what portion of the IFN-γ measured in vivo is derived from the IFN-γ–producing C. neoformans strain versus the host leukocytes. To evaluate whether differences in IFN-γ levels are due to changes in production by the host or the IFN-γ–producing C. neoformans strain, IFN-γ KO (C.129S7(B6)-Ifngtm1Ts/J), and WT controls (BALB/cJ) were inoculated with C. neoformans strain H99γ as described above, and IFN-γ protein levels were quantified from lung homogenates at day 7 postinoculation (four to six mice per group). There was no significant difference in pulmonary IFN-γ production in WT mice (17.6 ± 1.947 pg/ml) compared with IFN-γ KO mice (11.00 ± 2.203 pg/ml), and overall amounts of IFN-γ were low. This comparison suggests that the majority of IFN-γ detected in the STAT1 KO mice was produced by the microbe. In contrast, H99γ-infected WT mice have greater levels of IFN-γ in the lungs, indicating that the host’s cells produce a detectable amount of IFN-γ (p < 0.05) above what is produced by the microbe alone and that this amount contributes to the global level of IFN-γ in the infected lungs of the WT mice. Thus, the data acquired from IFN-γ KO mice suggest that the pulmonary leukocytes in STAT1 KO mice have diminished IFN-γ production when infected with the IFN-γ–producing C. neoformans strain. The STAT1 KO mice demonstrated significantly higher levels of Th2-type cytokine IL-4 in the lungs at day 7 postinoculation compared with WT mice (p < 0.05). However, IL-4 levels on day 10 and levels of IL-5 and immune-regulatory cytokine IL-10 in STAT1 KO and WT mice were not significantly different during the time course evaluated. Overall, the cytokine milieu indicates that a drift in Th1/Th2 cytokine balance away from Th1 and toward Th2 occurred early in C. neoformans strain H99γ-inoculated STAT1-deficient mice. 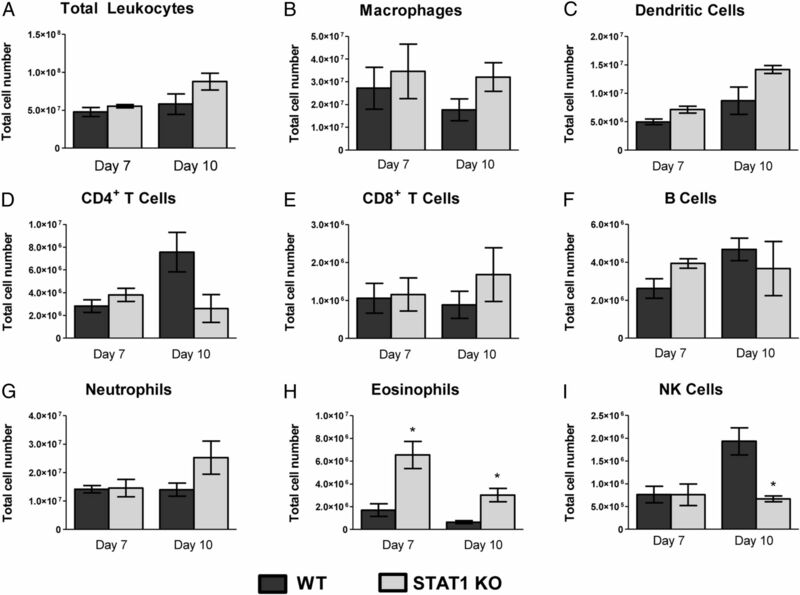 However, the subsequent increases in proinflammatory cytokine and chemokine production in the lungs of STAT1 KO mice compared with WT type mice during H99γ infection were much more dramatic, an indication of aberrant immune responses. We observed significant increases in IL-17A at days 7 and 10 postinoculation (p < 0.001) and of IL-1β, IL-6, G-CSF, and TNF-α at day 10 postinoculation (p < 0.05) within lung homogenates of STAT1 KO mice compared with WT mice during C. neoformans strain H99γ infection (Table I). IL-1α levels were also increased, although not significantly, at day 10 postinoculation in the STAT1 KO mice compared with WT mice. In addition, we observed significantly decreased CCL5 production (p < 0.001) at days 7 and 10 postinoculation in STAT1 KO mice compared with WT mice but significantly increased CXCL1 and CCL2 production (p < 0.01) at day 10 postinoculation in STAT1 KO mice compared with WT mice. These data show that more robust proinflammatory and altered chemokine responses occur in STAT1 KO mice compared with the WT mice during infection with C. neoformans strain H99γ. This increase in inflammatory cytokines was highly pronounced at day 10, consistent with an increasingly dysregulated inflammatory response promoting inflammatory pathology in response to the expansion of C. neoformans in the lungs. Although STAT1 signaling was required to mediate protection against pulmonary cryptococcosis, the changes in inflammatory responses and cytokine profiles could only partially explain the severe defect in fungal clearance of STAT1 KO mice. We sought to establish a causal link between STAT1 signaling and M1 macrophage activation, which we have previously shown correlates with disease resolution (24). Therefore, to examine macrophage polarization, we quantified the expression of genes associated with M1 and M2 macrophage activation in macrophages isolated from H99γ infected lungs of STAT1 KO compared with WT mice. Pulmonary F4/80+ macrophages were isolated at days 7 and 10 postinoculation with H99γ, and total RNA was evaluated for the expression of genes commonly associated with macrophage activation using real-time PCR (Fig. 5). Gene expression of the M1 activation marker iNOS was significantly decreased in STAT1 KO mice compared with WT mice at day 7 by 200-fold (p < 0.001; Fig. 5A) and at day 10 by 10-fold (p < 0.01). Conversely, mRNA expression for M2 macrophage activation markers Arg1 and CD206 were significantly increased at days 7 (p < 0.05 and p < 0.01, respectively; Fig. 5B) and 10 (p < 0.05) postinoculation in STAT1 KO mice compared with WT mice. M2 activation marker found in inflammatory zone 1 (FIZZ1) expression also was increased in macrophages from STAT1 KO mice, although not significantly, and chitinase 3-like 3 (Ym1) expression was significantly increased in macrophages from STAT1 KO mice at day 7 postinoculation (p < 0.01; Fig. 5B) and increased, although not significantly, at day 10 postinoculation compared with expression in macrophages from WT mice. Gene expression of the proinflammatory cytokine IFN-γ was increased in macrophages from WT mice, although not significantly, compared with macrophages from STAT1 KO mice at days 7 and 10; however no difference was observed in the expression of TNF-α or IL-17A. Gene expression for cytokines IL-4 and IL-13, which are associated with a nonprotective Th2-type response and M2 macrophages, was not different in macrophages from STAT1 KO mice compared with WT mice. Also, gene expression of CXCL9 and CXCL10, downstream chemokines in the STAT1 signaling pathway, was significantly decreased in macrophages from STAT1 KO mice compared with WT mice (p < 0.001; Fig. 5A). Gene expression of CXCL9 was increased by ∼13,000-fold, and CXCL10 was increased by 300-fold at day 7 postinoculation, suggesting an increase in chemokine-induced infiltration of leukocytes to the site of infection. Furthermore, gene expression for transcription factor IRF-1, which is induced by STAT1, was significantly decreased in macrophages from STAT1 KO mice compared with macrophages WT from mice (p < 0.001; Fig. 5A). Altogether, the gene expression profile demonstrates that STAT1 signaling is required for M1 macrophage polarization during pulmonary C. neoformans H99γ infection. STAT1 signaling is required for polarization of M1 macrophages in response to Cryptococcus strain H99γ infection. 129S6/SvEv (WT) and STAT1 KO mice were inoculated with 1 × 104 CFU C. neoformans strain H99γ. Pulmonary F4/80+ macrophages were isolated from the lungs of WT and STAT1 KO mice at days 7 and 10 postinoculation with C. neoformans strain H99γ. Total RNA was extracted and transcripts were analyzed for markers and cytokines associated with M1 (A) and M2 (B) macrophage activation. The indicated mRNA levels were normalized to GAPDH. Results are expressed as mean ± SEM and are cumulative of three experiments using five mice per group per time point. *p < 0.05, **p < 0.01, ***p < 0.001. NO and ROS are byproducts of M1 activated macrophages and these molecules together account for the oxidative microbicidal arsenal of phagocytes. Both NO and ROS are thought to be important for C. neoformans killing by host cells (24, 55–60). To assess the antifungal activity of STAT1-deficient macrophages in response to C. neoformans strain H99γ, we isolated pulmonary macrophages from STAT1 KO and WT mice at days 7 and 10 postinoculation. The macrophages were lysed to release any intracellular cryptococci and the fungal burden was determined to quantify antifungal efficiency of macrophages. Macrophages also were examined for ROS production or cultured for 24 h in vitro, and nitrite production was measured in the culture supernatants. Additional C. neoformans cells were not added to the cell culture medium because the macrophages were already infected in vivo. We observed no significant difference in the number of cryptococci found within macrophages obtained from STAT1 KO and WT mice at day 7 postinoculation; however, significantly more yeast were found within macrophages isolated from STAT1-deficient mice compared with macrophages from WT mice at day 10 postinoculation (p < 0.01; Fig. 6A). Furthermore, the morphology of intracellular organisms was different between WT and STAT1 KO mice. By day 10, macrophages from WT mice contained predominantly degraded organisms as documented by the presence of vacuoles that contained contracted and/or fragmented yeasts or the capsular material alone (Fig. 6B). In contrast, macrophages from STAT1 KO mice contained large and heavily capsulated yeast cells that grouped in multicellular clusters and robustly stained with mucicarmine (Fig. 6B), consistent with viable and intracellular proliferating yeasts and illustrating the diminished capacity of the macrophages for control of intracellular fungal proliferation. Anticryptococcal activity of pulmonary macrophages requires STAT1-dependent NO production. 129S6/SvEv (WT) and STAT1 KO mice were intranasally inoculated with 1 × 104 CFU of C. neoformans strain H99γ. Macrophages were isolated from the lungs of WT and STAT1 KO mice at days 7 and 10 postinoculation and intracellular cryptococci enumerated (A). Lungs of H99γ-infected WT and STAT1 KO mice at day 10 postinoculation were processed and analyzed using a light microscope (B). Note that pulmonary macrophages in the WT mice contain small vacuoles/inclusions consistent with degraded cryptococci and no evidence of intracellular growth. Macrophages in STAT1 KO mice harbor large cryptococci with well-developed capsules grouped in clusters of newly divided cells. Isolated pulmonary macrophages were examined for ROS production (C) or cultured ex vivo for 24 h, and supernatants were analyzed for the presence of NO (D). Data are expressed as the mean ± SEM and are cumulative of three experiments using three to fice mice per group per time point (A, C, and D) or are representative images derived from two experiments using three mice per group stained with H&E and mucicarmine and photographed at original magnification ×100, objective power (B). **p < 0.01, ***p < 0.001. To further demonstrate a molecular basis for the diminished control of intracellular cryptococci by STAT1 KO mice, we assessed ROS and NO production by macrophages isolated from WT and STAT1 KO mice at days 7 and 10 postinoculation. At day 7 postinoculation, a small but significant reduction of ROS was detected in macrophages from STAT1 KO mice compared with WT mice (p < 0.001; Fig. 6C). However, at day 10 postinoculation, there was no difference in the ROS production by macrophages between the two groups. This suggests that STAT1 plays only a minor role in induction of ROS production by macrophages and that ROS generation is insufficient for control of C. neoformans proliferation within macrophages (Fig. 6A). NO production was assessed by measuring nitrite accumulation in the supernatants of the 24-h macrophage cell cultures. Macrophages isolated from STAT1 KO mice inoculated with C. neoformans strain H99γ at days 7 and 10 postinoculation had a profound decrease in nitrite accumulation following 24 h of culture compared with macrophages from H99γ-infected WT mice (p < 0.01, p < 0.001, respectively; Fig. 6D). These data correlate with the significant decrease in gene expression for iNOS, the enzyme that catalyzes NO production and hallmark marker of M1 macrophage activation, in macrophages from STAT1 KO mice compared with WT mice (Fig. 5A). Thus, loss of STAT1 signaling results in profound defect in NO production by macrophages in response to C. neoformans H99γ infection, which correlates with decreased antifungal efficiency and increased intramacrophage residence of cryptococci. The identification of specific mechanisms that mediate the induction of protective immune responses following C. neoformans infection are likely to aid in the development of novel immunotherapies for treatment of cryptococcosis. We have developed a murine infection model with C. neoformans strain H99γ, a strain that secretes murine IFN-γ, which rapidly induces 1) a protective Th1-type immune response in mice, 2) classical, M1, macrophage activation, and 3) resolution of infection with a protective memory (24, 26, 42, 50–52). This immune response to C. neoformans strain H99γ results in upregulation of the STAT1 pathway in macrophages. STAT1 has been shown to play a major role in mediating immune and proinflammatory actions of IFN-γ (61), a cytokine important for regulation of the immune response (reviewed in Ref. 62). Signaling via the IFN-γ-JAK1/2-STAT1 pathway is imperative for resistance to various intracellular pathogens including Listeria monocytogenes and Toxoplasma gondii (61, 63–65). Previous studies have shown that loss of STAT1 signaling in mice results in a complete lack of responsiveness to IFN-γ and IFN-α, correlating with high sensitivity to infection by some microbial pathogens (61, 65, 66). However, the role of STAT1 in the development of protective immunity to C. neoformans has not been investigated. In this paper, to our knowledge, we present for the first time that STAT1 is required for the generation of immune protection against C. neoformans. Our data further highlight that STAT1 is not absolutely required for the development of T cell–mediated immune responses; however, it contributes to Th1 development and is critical for M1 polarization of macrophages and their fungicidal function. The present studies were designed to evaluate a putative role of STAT1 signaling in mediating protection against pulmonary infection with C. neoformans. We previously examined the JAK/STAT pathway and TLR pathways in which we observed increased gene expression of members of the IFN-γR pathway, including STAT1, IRF-1, CXCL9, and CXCL10 (24). However, we detected no changes in expression of other STAT genes, MAPK genes, or genes within the TLR pathways (24). Our results demonstrate that STAT1 deficiency in mice results in increased fungal burden and decreased survival when inoculated with C. neoformans strain 52D and C. neoformans strain H99γ, whereas WT mice were able to clear infection with both of these strains. Furthermore, inoculation with C. neoformans strain 52D resulted in increased dissemination to the brain in STAT1 KO mice compared with WT mice. A similar trend occurred during inoculation with C. neoformans strain H99γ where lack of STAT1 signaling also resulted in increased trafficking of the yeast to the brain (data not shown). The increased trafficking to the CNS in the STAT1-deficient mice may be due to the loss of control of the pulmonary infection, which then leads to dissemination. Altogether, these data indicate that STAT1 signaling has a role in prevention of dissemination to the CNS. Collectively, these results indicate that STAT1 signaling is essential for the generation of the protective immune response to C. neoformans infection in mice. The data further show that loss of STAT1 signaling did not result in deficient leukocyte accumulation in the lungs. A trend toward increased leukocyte recruitment and an increase in the production of some but not all proinflammatory cytokines and chemokines occurred within the lungs of STAT1 KO mice. These data imply that the deficient cryptococcal clearance from the lungs of inoculated STAT1 KO mice is a result of a dysregulated immune response. Consistent with this view, the overall magnitude of the T cell response did not appear to be defective in the STAT1 KO mice. IFN-γ and STAT1 induce the transcription factor T-bet, which in turn promotes Th-1 type T cell development (67, 68). In addition, T-bet suppresses GATA3, a transcription factor that aids in regulation of Th2-type immune responses (69–72). Interestingly, although some decrease in Th1 cytokines was observed, the levels of Th2-associated cytokines IL-4, IL-5, and IL-13 were not dramatically different between WT and STAT1-deficient mice, except for IL-4 at day 7 postinoculation. The lack of major changes in expression of these cytokines that are transcriptionally enhanced by GATA3 suggests that STAT1 deletion did not significantly affect GATA3 levels. These findings suggest that STAT1 is more important for execution of downstream effector mechanisms, such as M1 macrophage activation, rather than the upstream regulation of T cell polarizing responses during cryptococcal infection. However, further studies including T-bet and GATA3 expression levels by T cells during cryptococcal infection in STAT1 KO mice are needed to definitively address this point. Apart from the increased cryptococcal Ag load, the uncontrolled inflammation may be a result of the loss of regulatory proteins that are induced downstream of STAT1 signaling. We observed that transcripts for IRF-1, a regulatory protein induced by STAT1 (62, 73, 74), were decreased in macrophages from STAT1 KO mice compared with WT mice. Although IRF-1 participates in regulation of the IFN-γ/STAT1 pathway, this protein also plays a role in other pathways to restrain the proinflammatory immune response, thus limiting damage to the host. Macrophages from STAT1 KO mice also had a decrease in transcripts for CXCL9 and CXCL10, and IFN-γ induced chemokines that play a role in attracting other immune cells including Ag-specific Th1 cells and NK cells (46, 75). This may partially explain the decreasing trend in CD4+ T cells and the significant decrease in NK cells trafficking into the lungs of the STAT1-deficient mice at day 10 postinoculation. The necessity of NK cell activity during cryptococcal infection is unclear. Although it has been demonstrated that the absence of NK cells results in a reduction of fungal clearance from the lungs and spleens (76, 77), studies conducted in our laboratory show that mice depleted of NK cells maintain a protective immune response to C. neoformans strain H99γ (data not shown). In addition, CXCL9 has been reported to inhibit eosinophil infiltration (78, 79); therefore, the decrease in CXCL9 gene expression by macrophages may be, to some degree, responsible for the increased eosinophilia observed in the STAT1 KO mice. It is very important for the host to be able to respond to an invading pathogen with a balance between pro- and anti-inflammatory factors because excessive inflammation can result in severe lung pathology and ultimately death (80, 81). Cytokine analysis of pulmonary tissue from STAT1 KO mice showed increased levels of proinflammatory cytokines and a substantial increase in pulmonary leukocyte infiltrates compared with WT mice; however, the STAT1-deficient mice were unable to eradicate the yeast and permitted rapid fungal proliferation. This increase in pulmonary fungal burden could contribute to the increased production of proinflammatory factors leading to increased inflammation. Taken together, these studies demonstrate that although STAT1 is not required for leukocyte recruitment in response to C. neoformans strain H99γ infection, they strongly suggest that STAT1 signaling may be directly (through the regulatory negative feedback loops) and/or indirectly (increased fungal burden) responsible for limiting damage-inducing inflammation. It is accepted that macrophage activation phenotype is important for host defense against Cryptococcus infection (24–26, 35, 36, 42, 82). Our data show that when STAT1 signaling is ablated in the host, there is an increase in Arg1 gene expression and a decrease in iNOS gene expression compared with WT mice. Overall, this indicates a shift in the Arg1:iNOS ratio favoring Arg1 and M2 macrophage activation, suggesting that the loss of STAT1 signaling leads to alternative activation of macrophages that are associated with nonprotective responses to C. neoformans. Although loss of STAT1 signaling does not significantly alter the total numbers of macrophages trafficking into the lungs during inoculation with C. neoformans strain H99γ, it appears that it is the quality and not quantity of macrophages that aids in eradication of the yeast. Assays measuring macrophage production of ROS and NO, molecules associated with anticryptococcal activity, reveal that STAT1 has minimal effect in promoting ROS generation but has a profound effect on NO production. Although sufficient in ROS generation, STAT1-deficient macrophages produced significantly less NO compared with WT macrophages, which correlated with a defect in cryptococcal killing. These effects are attributed to dramatically decreased iNOS expression but also significantly increased Arg1. Arg1 competes with iNOS for the substrate l-arginine (37); therefore, the observed decrease in NO production in STAT1-deficient macrophages could be linked to the changes in both of these enzymes. In support of this theory, previous studies have shown that the ratio Arg1/iNOS is predictive of the fungicidal activity of macrophages during C. neoformans infection (31, 54, 83). Our results showing that STAT1 deficiency result in a >100-fold change in Arg1/iNOS ratio at days 7 and 10 postinfection is consistent with the diminished fungicidal capacity observed by macrophages from STAT1 KO mice infected with C. neoformans strain H99γ. Collectively, our data indicate that the most important function of STAT1 in anticryptococcal immunity is to mediate M1 polarization of macrophages, which is then crucial for protection against pulmonary cryptococcosis by the production of NO with possible contribution of other factors such as activation of lysosome enzymes, which was not investigated at this time. Our new data combined with our previous observation of increased STAT1 phosphorylation in macrophages from protectively immunized mice strongly suggest that this is an intrinsic effect of STAT1 determining the fate of macrophage polarization downstream of IFN-γ signaling. One caveat to this conclusion is that the general STAT1 deletion also resulted in diminished IFN-γ production in the infected lungs. Because IFN-γ is the major factor driving M1 polarization, some of the in vivo effects of the STAT1 deletion could be associated with an indirect effect of STAT1 on IFN-γ production. Future studies using transgenic mice with cell-restricted STAT1 abrogation will be useful tools to specifically address this point. The applications of these findings have the potential to spread beyond the scope of cryptococcosis. IFN-γ activated macrophages have been shown to have fungicidal activity against Histoplasma capsulatum (84–86), whereas presence of IL-4 and IL-10 results in inhibition of apoptosis and increase in disease severity (87). M1 activated macrophages have also been associated with antifungal effects against Aspergillus fumigatus (88), Blastomyces dermatitidis (89–91), and Paracoccidioides brasiliensis (90, 92, 93). Therefore, the development of therapeutics that induce M1 macrophage activation via an IFN-γ/STAT1 mechanism may provide protection against a myriad of microbial pathogens. Collectively, our data show that STAT1 plays an essential role in the development and execution of crucial effector mechanisms in protective immunity to pulmonary cryptococcosis: Th1 and M1 polarizations of T cells and macrophages, respectively. Activation of M2 macrophages, as demonstrated in the H99γ-inoculated STAT1 KO mice, does not appear to aid in clearance of Cryptococcus from the lungs but instead hinders antifungal mechanisms. Furthermore, NO but not ROS production appears to be critical for control of C. neoformans strain H99γ proliferation within macrophages. This is consistent with the hypothesis that STAT1-induced M1 macrophages are essential to mount a protective immune response against C. neoformans. These data represent the first evidence, to our knowledge, of an intracellular signaling mechanism in an effector cell population by which the host executes a protective immune response to C. neoformans. This work was supported by Research Grant 2RO1 AI071752 from the National Institute of Allergy and Infectious Diseases of the National Institutes of Health (to F.L.W. ), Grant W911NF-11-1-0136 from the Army Research Office of the Department of Defense (to F.L.W. ), and Department of Veterans Affairs Merit Review Grant 1I01BX000656 (to M.A.O.).
. 1989. Infections with Cryptococcus neoformans in the acquired immunodeficiency syndrome. N. Engl. J. Med. 321: 794–799. 1988. Cryptococcal meningitis in patients with AIDS. J. Infect. Dis. 157: 624–628.
. 1986. Cryptococcal infections in patients with acquired immune deficiency syndrome. Am. J. Med. 81: 19–23.
. 1986. The pathology of pulmonary cryptococcal infections in the acquired immunodeficiency syndrome. Arch. Pathol. Lab. Med. 110: 502–507.
. 1985. Cryptococcosis in the acquired immunodeficiency syndrome. Ann. Intern. Med. 103: 533–538.
. 1974. Prognostic factors in cryptococcal meningitis: a study in 111 cases. Ann. Intern. Med. 80: 176–181.
. 1977. Cryptococcosis, with emphasis on the significance of isolation of Cryptococcus neoformans from the respiratory tract. Chest 72: 13–19.
. 1962. Cryptococcal infection following steroid therapy. Ann. Intern. Med. 56: 114–120.
. 1951. The coincidence of cryptococcosis and disease of the reticulo-endothelial and lymphatic systems. Cancer 4: 883–889.
. 1950. Cryptococcosis; a review with special reference to apparent association with Hodgkin’s disease. Am. J. Med. 9: 343–355.
. 1956. Fungal diseases in a general hospital; a study of 88 patients. Am. J. Clin. Pathol. 26: 1235–1253.
. 1972. The wide spectrum of cryptococcal infections. Am. J. Med. 53: 315–322.
. 2001. Cryptococcus neoformans infection in organ transplant recipients: variables influencing clinical characteristics and outcome. Emerg. Infect. Dis. 7: 375–381.
. 2005. An immune reconstitution syndrome-like illness associated with Cryptococcus neoformans infection in organ transplant recipients. Clin. Infect. Dis. 40: 1756–1761.
. 2010. Invasive fungal infections among organ transplant recipients: results of the Transplant-Associated Infection Surveillance Network (TRANSNET). Clin. Infect. Dis. 50: 1101–1111.
. 1993. Treatment of cryptococcosis with liposomal amphotericin B (AmBisome) in 23 patients with AIDS. AIDS 7: 829–835.
. 1999. Drug resistance in Cryptococcus neoformans. Drug Resist. Updat. 2: 259–269.
. 2006. The genomic landscape of histone modifications in human T cells. Proc. Natl. Acad. Sci. USA 103: 15782–15787.
. 1995. Cryptococcosis in the era of AIDS—100 years after the discovery of Cryptococcus neoformans. Clin. Microbiol. Rev. 8: 515–548.
. 2001. Serologic evidence for Cryptococcus neoformans infection in early childhood. Pediatrics 107: E66.
. 1999. Cryptococcosis in children with AIDS. Clin. Infect. Dis. 28: 309–313.
. 2006. Cryptococcosis. Infect. Dis. Clin. North Am. 20: 507–544, v–vi (v-vi.). 2012. Protective immunity against pulmonary cryptococcosis is associated with STAT1-mediated classical macrophage activation. J. Immunol. 189: 4060–4068. 2010. Pulmonary infection with an interferon-γ‑producing Cryptococcus neoformans strain results in classical macrophage activation and protection. Am. J. Pathol. 176: 774–785.
. 2009. Th2 but not Th1 immune bias results in altered lung functions in a murine model of pulmonary Cryptococcus neoformans infection. Infect. Immun. 77: 5389–5399.
. 2002. Induction of interleukin-12 and γ interferon requires tumor necrosis factor α for protective T1-cell‑mediated immunity to pulmonary Cryptococcus neoformans infection. Infect. Immun. 70: 2959–2964.
. 1994. The role of CD4+ and CD8+ T cells in the protective inflammatory response to a pulmonary cryptococcal infection. J. Leukoc. Biol. 55: 35–42.
. 1996. Afferent phase production of TNF-α is required for the development of protective T cell immunity to Cryptococcus neoformans. J. Immunol. 157: 4529–4536.
. 2008. Inheritance of immune polarization patterns is linked to resistance versus susceptibility to Cryptococcus neoformans in a mouse model. Infect. Immun. 76: 2379–2391.
. 2005. Distinct roles for IL-4 and IL-10 in regulating T2 immunity during allergic bronchopulmonary mycosis. J. Immunol. 174: 1027–1036.
. 2009. Cryptococcal urease promotes the accumulation of immature dendritic cells and a non-protective T2 immune response within the lung. Am. J. Pathol. 174: 932–943.
. 1988. Specific amino acid (l-arginine) requirement for the microbiostatic activity of murine macrophages. J. Clin. Invest. 81: 1129–1136.
. 1990. Metabolic fate of l-arginine in relation to microbiostatic capability of murine macrophages. J. Clin. Invest. 85: 264–273.
. 2007. Role of granulocyte macrophage colony-stimulating factor in host defense against pulmonary Cryptococcus neoformans infection during murine allergic bronchopulmonary mycosis. Am. J. Pathol. 170: 1028–1040.
. 2010. Cryptococcus neoformans variants generated by phenotypic switching differ in virulence through effects on macrophage activation. Infect. Immun. 78: 1049–1057. 2007. How cells respond to interferons revisited: from early history to current complexity. Cytokine Growth Factor Rev. 18: 419–423.
. 2003. Molecular mechanisms regulating Th1 immune responses. Annu. Rev. Immunol. 21: 713–758.
. 1997. Multistage regulation of Th1-type immune responses by the transcription factor IRF-1. Immunity 6: 673–679.
. 2006. STAT1 in peripheral tissue differentially regulates homing of antigen-specific Th1 and Th2 cells. J. Immunol. 176: 4959–4967.
. 2011. STAT1 hyperphosphorylation and defective IL12R/IL23R signaling underlie defective immunity in autosomal dominant chronic mucocutaneous candidiasis. PLoS One 6: e29248.
. 2011. STAT1 mutations in autosomal dominant chronic mucocutaneous candidiasis. N. Engl. J. Med. 365: 54–61.
. 2013. Signal transducer and activator of transcription 1 (STAT1) gain-of-function mutations and disseminated coccidioidomycosis and histoplasmosis. J. Allergy Clin. Immunol. 131: 1624‑1634 e1617.
. 2007. Protection against cryptococcosis by using a murine gamma interferon-producing Cryptococcus neoformans strain. Infect. Immun. 75: 1453–1462. 2011. Protective immunity against experimental pulmonary cryptococcosis in T cell‑depleted mice. Clin. Vaccine Immunol. 18: 717–723.
. 1991. Immunity to a pulmonary Cryptococcus neoformans infection requires both CD4+ and CD8+ T cells. J. Exp. Med. 173: 793–800.
. 2003. Superoxide dismutase influences the virulence of Cryptococcus neoformans by affecting growth within macrophages. Infect. Immun. 71: 173–180.
. 2005. Identification and characterization of an SKN7 homologue in Cryptococcus neoformans. Infect. Immun. 73: 5022–5030.
. 2006. The Cryptococcus neoformans catalase gene family and its role in antioxidant defense. Eukaryot. Cell 5: 1447–1459.
. 2003. Enzymes that counteract nitrosative stress promote fungal virulence. Curr. Biol. 13: 1963–1968.
. 2000. Differing requirement for inducible nitric oxide synthase activity in clearance of primary and secondary Cryptococcus neoformans infection. Med. Mycol. 38: 343–353.
. 1995. A role for γ interferon-induced nitric oxide in pulmonary clearance of Cryptococcus neoformans. Am. J. Respir. Cell Mol. Biol. 13: 116–124.
. 1996. Targeted disruption of the Stat1 gene in mice reveals unexpected physiologic specificity in the JAK-STAT signaling pathway. Cell 84: 431–442.
. 2010. 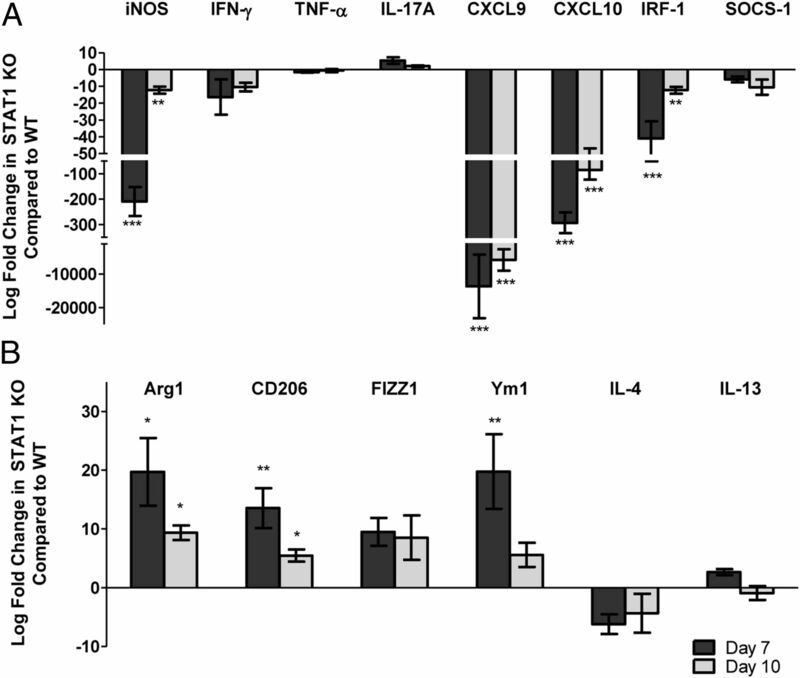 Gene modulation and immunoregulatory roles of interferon γ. Cytokine 50: 1–14.
. 2012. Conditional Stat1 ablation reveals the importance of interferon signaling for immunity to Listeria monocytogenes infection. PLoS Pathog. 8: e1002763.
. 2012. Impaired chromatin remodelling at STAT1-regulated promoters leads to global unresponsiveness of Toxoplasma gondii‑infected macrophages to IFN-γ. PLoS Pathog. 8: e1002483.
. 2004. STAT1 is essential for antimicrobial effector function but dispensable for gamma interferon production during Toxoplasma gondii infection. Infect. Immun. 72: 1257–1264.
. 2004. STAT1 plays a critical role in the regulation of antimicrobial effector mechanisms, but not in the development of Th1-type responses during toxoplasmosis. J. Immunol. 172: 457–463.
. 2002. T-bet is a STAT1-induced regulator of IL-12R expression in naïve CD4+ T cells. Nat. Immunol. 3: 549–557.
. 2001. T-bet is rapidly induced by interferon-γ in lymphoid and myeloid cells. Proc. Natl. Acad. Sci. USA 98: 15137–15142.
. 2006. T-bet regulates Th1 responses through essential effects on GATA-3 function rather than on IFNG gene acetylation and transcription. J. Exp. Med. 203: 755–766.
. 1997. Transcription factor GATA-3 is differentially expressed in murine Th1 and Th2 cells and controls Th2-specific expression of the interleukin-5 gene. J. Biol. Chem. 272: 21597–21603.
. 1997. A family of cytokine-inducible inhibitors of signalling. Nature 387: 917–921.
. 1999. SOCS1 is a critical inhibitor of interferon gamma signaling and prevents the potentially fatal neonatal actions of this cytokine. Cell 98: 597–608.
. 2010. Review: The chemokine receptor CXCR3 and its ligands CXCL9, CXCL10 and CXCL11 in neuroimmunity—a tale of conflict and conundrum. Neuropathol. Appl. Neurobiol. 36: 368–387.
. 1986. Natural cellular resistance of beige mice against Cryptococcus neoformans. J. Immunol. 137: 3624–3631.
. 1987. Role of natural killer cells in resistance to Cryptococcus neoformans infections in mice. Am. J. Pathol. 128: 354–361.
. 2004. Negative regulation of eosinophil recruitment to the lung by the chemokine monokine induced by IFN-gamma (Mig, CXCL9). Proc. Natl. Acad. Sci. USA 101: 1987–1992.
. 2005. CXCL9 inhibits eosinophil responses by a CCR3- and Rac2-dependent mechanism. Blood 106: 436–443.
. 2009. Virulence factors and their mechanisms of action: the view from a damage-response framework. J. Water Health 7(Suppl. 1): S2–S18.
. 2008. The damage-response framework of microbial pathogenesis and infectious diseases. Adv. Exp. Med. Biol. 635: 135–146.
. 2009. IL-4/IL-13‑dependent alternative activation of macrophages but not microglial cells is associated with uncontrolled cerebral cryptococcosis. Am. J. Pathol. 174: 486–496.
. 2013. Macrophage M1/M2 polarization dynamically adapts to changes in cytokine microenvironments in Cryptococcus neoformans infection. MBio 4: e00264–e13.
. 2012. Extracellular superoxide dismutase protects Histoplasma yeast cells from host-derived oxidative stress. PLoS Pathog. 8: e1002713.
. 2006. Human macrophages do not require phagosome acidification to mediate fungistatic/fungicidal activity against Histoplasma capsulatum. J. Immunol. 176: 1806–1813. 1999. Macrophages in host defense against Histoplasma capsulatum. Trends Microbiol. 7: 67–71. 2005. Apoptosis modulates protective immunity to the pathogenic fungus Histoplasma capsulatum. J. Clin. Invest. 115: 2875–2885.
. 2010. Serum amyloid P attenuates M2 macrophage activation and protects against fungal spore-induced allergic airway disease. J. Allergy Clin. Immunol. 126: 712‑721 e717.
. 2005. Immunological basis for susceptibility and resistance to pulmonary blastomycosis in mouse strains. Cytokine 32: 12–19.
. 1988. In vivo and in vitro activation of pulmonary macrophages by IFN-γ for enhanced killing of Paracoccidioides brasiliensis or Blastomyces dermatitidis. J. Immunol. 140: 2786–2789.
. 2011. Blastomyces dermatitidis yeast cells inhibit nitric oxide production by alveolar macrophage inducible nitric oxide synthase. Infect. Immun. 79: 2385–2395.
. 2008. Killing of Paracoccidioides brasiliensis yeast cells by IFN-γ and TNF-α activated murine peritoneal macrophages: evidence of H2O2 and NO effector mechanisms. Mycopathologia 166: 17–23.
. 1988. γ-Interferon activation of macrophages for killing of Paracoccidioides brasiliensis and evidence for nonoxidative mechanisms. Int. J. Immunopharmacol. 10: 945–952.